While there has been lots of speculation over what type of Easter Eggs might be included in Man Of Steel related to other DC Comics characters, it turns out that the first Easter Egg was already revealed in the third Man Of Steel trailer. At the two minute and twenty-seven second mark in the third Man Of Steel trailer, Superman and General Zod are shown flying directly at each other with the Metropolis skyline in the background. In the Metropolis skyline, there is a building with a blurry yellow and white neon sign. 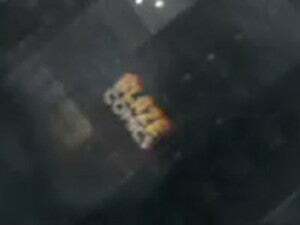 Comicbook.com blew up a hi-res version of the image, and the blurry yellow and white sign is actually for “Blaze Comics.” In DC Comics, Blaze Comics is the comic book publisher that publishes the Booster Gold comic book series. Booster Gold is a time-traveling superhero from the 25th Century, who is known for branding himself and doing product endorsements. 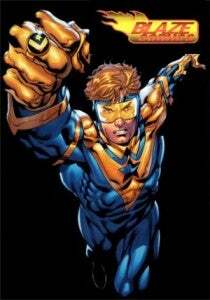 Booster Gold was originally based in Metropolis, which is also the city of Superman. This Blaze Comics Easter Egg is the first official sign that Superman is operating in a world where other DC Comics characters exist. While it's entirely possible that director Zack Snyder included Blaze Comics as just a clever little Easter Egg for fans, there is one other thing we noticed that indicates it could possible be something more. The scene of Superman and General Zod flying at each other actually appears in the second Man Of Steel trailer without the Blaze Comics Easter Egg. The background of the scene appears to have been specifically changed to include the Booster Gold Easter Egg. The image at the top of this article shows a side-by-side comparison of the Superman and General Zod scene with the third trailer image first and the second trailer image second. While it might seem unlikely that there will actually be a Booster Gold cameo in Man Of Steel, it does raise the question of why the filmmakers went out of their way to add a Booster Gold Easter Egg. As positive word of mouth is growing for the Man Of Steel, could Warner Bros. be laying the groundwork for how they bring together a Justice League movie? What if Booster Gold is the character that eventually pulls the Justice League together? Maybe, he travels back to the past specifically to help form the Justice League to deal with some future threat. Another possibility might be that DC Comics is looking to build a connected movie and TV universe, like Marvel is doing with The Avengers movies and S.H.I.E.L.D. TV series. Last year, it was announced that SyFy was developing a Booster Gold TV series, could this be a tie-in to help promote a TV series? Man Of Steel is scheduled to be released in movie theaters in the United States on June 14, 2013.